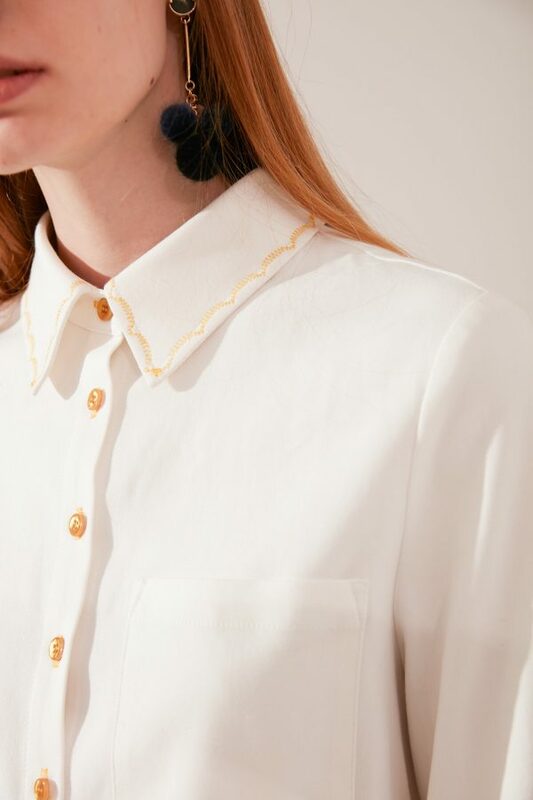 Our beautiful Embroidered Collar Shirt is a modern update on an everyday essential. Cut from a velvety soft, medium weight cotton blend, this fabric is perfect for moderate to cooler weather. I used to be afraid of white shirts because many are sheer and the bust area would be too tight (I am 34D). When I saw the gold accents on this shirt I thought they looked so cute. I decided to try it out since return shipping is also free and boy am I glad I gave it a chance! The fabric is substantial and not sheer at all so I don’t have to show my bra to the whole world. The bust area is also not tight making this shirt work appropriate. Most importantly it is super comfy. The polyester tops makes me feel like I’m wrapped in a plastic bag, but this shirt is so breathable (important for sensitive skin). I wear mine with dark skinny jeans and pointy loafers and it has since become my “uniform”. Thank you skye for making a white button down that is beautiful and functional! Oh, and I love that it is made ethically as well. Keep it up! This is the second top I bought from skye and I love the way these fit and just look so minimalist, but still have interesting accents. I have gotten a lot of compliments from my friends! People really notice the small details that set this shirt apart from all the other plain white shirts and always ask where I got it. I wear this underneath a crew neck sweater in the winter and the crisp white collar with the gold threads look so pretty peeking out! I can’t wait to wear it alone in spring as well! 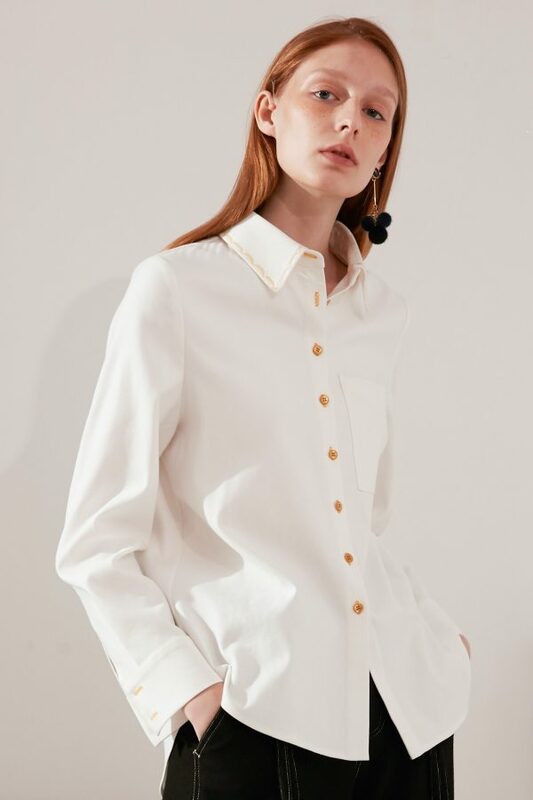 Love a good classic button down, but it is becoming very hard to find one that is not overly tight, oversized or sheer. These are perfect for everyday wear. Will last for many seasons to come. This shirt is so pretty! The fabric is velvety soft and you could tell it is high quality just by touching it. I love the small gold details that make it stand out. Very minimalist chic! I have about 20 pieces in my capsule wardrobe so I only keep something I can wear all the time. This shirt is perfect for work with black slacks and weekend with boyfriend jeans and mules. I wear it at least twice every week, so I consider that money well spent.